Optimise your waste collection by up to 40%. With our sensor solutions you'll know exactly when your bins are full - so you can empty them at the right time. You will enjoy a double time gain. We automate your disposal and ensure that your employees will spend less time on the road. With us, you can drive the optimal route and avoid trips to containers that are only half- or quarter-full. This will reduce your mileage. You help to make the air cleaner and cities more sustainable and more viable. An economically valuable solution. 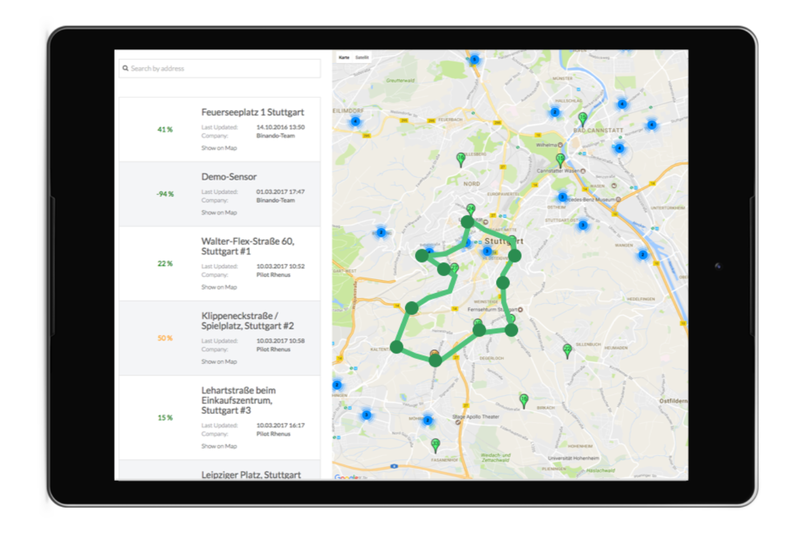 Giosprite offers you all the components and functions to optimise your routes from a single source. You do not need any technical know-how or other components to benefit from our solution. 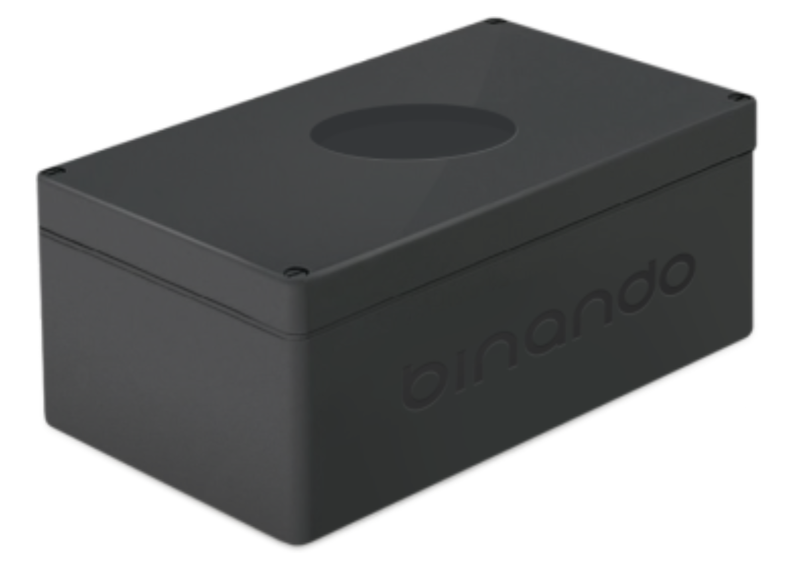 Our flexible solution allows the Binando sensors to be installed easily on your different waste container systems. The sensor system scores through a robust appearance. A splash-proof housing protects the sensors optimally against external weather influences. Thanks to our well-tuned energy management, our sensors have long-term maintenance-free operating times. Our software is a cloud based solution which you can use directly in your browser. 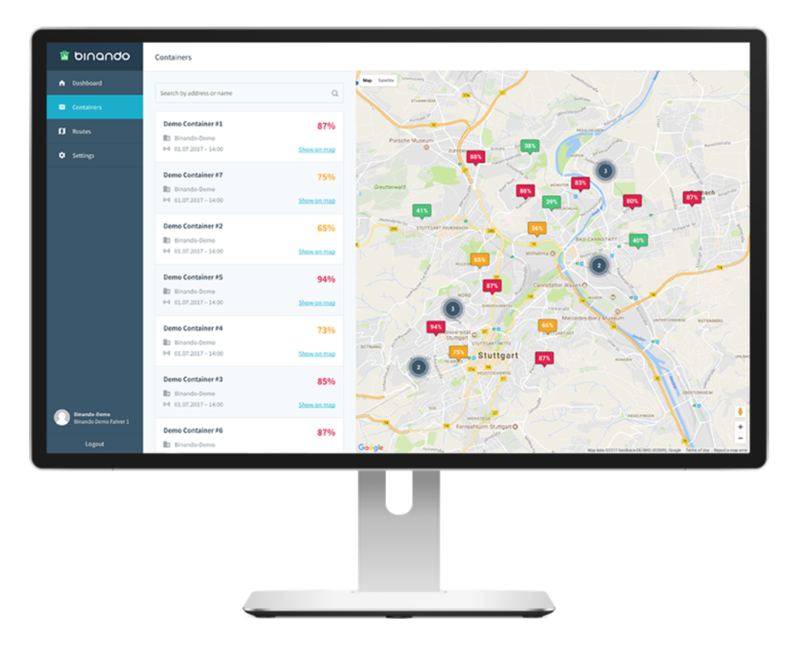 Binando includes tailored views that help you to monitor your containers, vehicles and routes at a glance. Do you have your own system which you would like to use again? No problem – through our interfaces, we can easily integrate the data. Your driver receives the optimal route in the form of a navigation solution directly into the vehicle. Either by means of a tablet solution or in the existing telematics system. Our navigation solution includes live traffic information. Your driver can react quickly to upcoming traffic congestion. Giosprite takes individual characteristics such as narrow roads, truck dimensions and your loading capacities into account.